Today (August 29, 2016) is Temple Grandin’s 69th birthday. A spokesperson and consultant for the livestock industry, her work in the field of animal facilities design has earned her recognition from the American Society of Agricultural and Biological Engineers, most notably for the adaptation of curved corrals intended to reduce stress and injury to animals being led to slaughter. While her motivations for helping animals may be well-intentioned – is this idea really a meaningful way of helping animals? Slaughterhouses are always places of immense terror, fear, pain and suffering — no matter how they are designed. 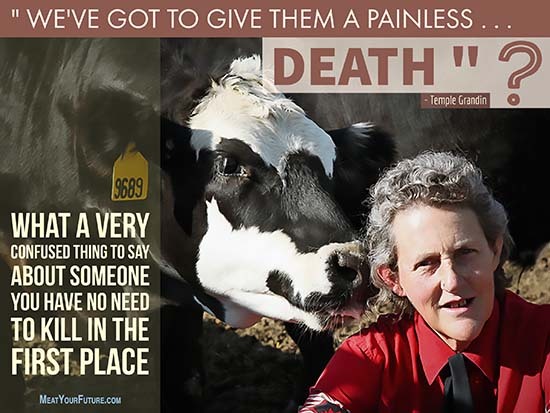 We kid ourselves if we think it’s possible to painlessly kill billions of animals who do not want to die. And, given the sheer scale of demand for animal foods, providing farmed animals with anything resembling any sort of “decent life” is also highly impractical (just the amount of the planet’s land currently dedicated to the livestock sector is already at an unsustainable and environmentally devastating level — and that’s with the vast majority of animal facilities being horribly crowded factory farms that are, at least from a land- and resource-use standpoint, the most “efficient”). The lack of congruence between building a career on needless animal slaughter while claiming respect and compassion for animals, is quite obvious in this case. What may not be as immediately obvious is the fact that consuming animal foods is also not congruent with respecting animals — especially since we do not need to consume any animal flesh or byproducts to be healthy, and doing so results in such an immense degree of unnecessary harm and suffering. Rather than trying to find better ways to do the wrong thing, let’s move past causing needless suffering to billions of animals entirely. The animals deserve no less, and — as no small added bonus — your personal health and our planet will also benefit.